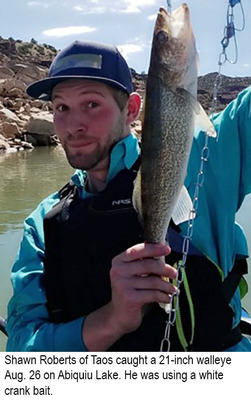 Abiquiu Lake: Shawn Roberts of Taos caught a 21-inch walleye Aug. 26. He was using a white crank bait. Bluewater Lake: Connor Hansen, age 8, of Edgewood caught and released a 33-inch tiger muskie, his first, Aug. 26. He was using a lure. Dane Perez, age 12 of Albuquerque caught and released a 31.5-inch tiger muskie Aug. 25. He was using a Pot-O-Gold lure. Caenan Perez, age 13, of Albuquerque caught and released a 39.5-inch tiger muskie Aug. 25. He was using a Pot-O-Gold lure. Canjilon Lakes: Nevaeh Olivas, age 3, of Chamita caught her first four trout, ranging in size from 10 to 14 inches Aug. 27. She was using salmon eggs. 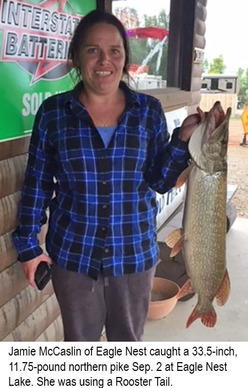 Eagle Nest Lake: Jamie McCaslin of Eagle Nest caught a 33.5-inch, 11.75-pound northern pike Sept. 2. She was using a Rooster Tail. Jim McElroy caught a 24-inch, 4.5-pound rainbow trout Sept. 2. He was using a Platte River special with salmon peach PowerBait. Thomas and Victoria Ford of Moriarty caught several nice trout including one that measured 22 inches. They were using salmon peach and nymph grape PowerBait. Pecos River: David Calderon, Jr. of Loving caught a 30-pound flathead catfish. He was fishing in the Malaga area with rod and reel and using Winnie for bait. Nicky Knight, age 7, of Albuquerque caught a nice brown trout Sept. 1. He was fishing with his dad and using worms. 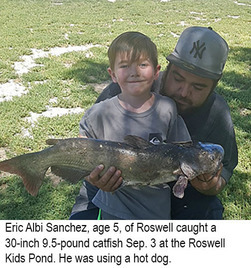 Roswell Kids Pond: Eric Albi Sanchez, age 5, of Roswell caught a 30-inch 9.5-pound catfish Sept. 3. He was using a hot dog. 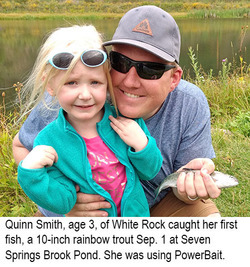 Seven Springs Brood Pond: Quinn Smith, age 3, of White Rock caught her first fish, a 10-inch rainbow trout Sept. 1. She was using PowerBait. Stubblefield Lake: Hue Gonzales of Angel Fire caught a largemouth bass that weighed about 4 pounds. He was using a spinner bait with a purple and grey swim bait trailer. Tingley Beach: Joshua Valenzuela, age 6, of Albuquerque caught an 18-inch catfish Sept. 3. He was using hot dogs. Jacqueline Valenzuela, age 3, caught a 26-inch catfish Sept. 3. She was using hot dogs. Charette Lakes: Fishing was good using PowerBait and salmon eggs for trout. Cimarron River: Stream flow near the town of Cimarron on Monday morning was 21.0 cfs. Fishing was good using mayfly nymphs, Prince Nymphs and worms for trout. Trout fishing at the Gravel Pit Lakes was good using PowerBait, Fire Balls and worms. Clayton Lake: Fishing was fair to good using salmon eggs, PowerBait and Panther Martins for trout. Fishing was fair to good using chicken liver and worms for catfish. Fishing was good using worms for bluegill. We had no reports on other species. Conchas Lake: Fishing was very good using creature baits, swim jigs, ned rigs, wacky worms, chatter baits, crank baits and tubes for largemouth bass and smallmouth bass. Most of the bass were small. Fishing was fair to good using shrimp, cut bait and chicken liver for catfish. Fishing was fair using slab spoons and blade baits for white bass. Fishing was good using worms for bluegill. We had no reports on other species. The surface water temp was in the mid 70s. Cowles Ponds: Fishing very good using PowerBait, salmon eggs, terrestrials and small spinners for trout. Eagle Nest Lake: Fishing was fair to good using PowerBait and worms for perch. Mike Smith caught his limit and reported that a white PowerBait honey worm worked best. Fishing was fair to good trolling Panther Martins, wedding rings and Platte River specials tipped with PowerBait or corn for rainbow trout and a few kokanee. Fishing for northern pike was slow to fair with a few caught by anglers using streamers, spoons and Platte River specials. The surface water temp was around 67 degrees. The 26th Annual Fish Fest is under way and continues through Sept. 9. For more information call (575) 377-6941. Bank fishing has become a little more challenging with an increased moss growth. Eagle Rock Lake: Fishing was very good using PowerBait, worms, Fire Balls, Panther Martins, Super Dupers and Pistol Petes for trout. Gallinas River: Fishing was good using worms, PowerBait and bead-head pheasant tail nymphs for trout. Hopewell Lake: Fishing was fair to good using ant patterns, copper John Barrs, hoppers, PowerBait, salmon eggs and worms for trout. Lake Maloya: Fishing was good using PowerBait, worms, damsel flies, wooly buggers, small spoons and Panther Martins for trout up to 19 inches. Los Pinos River: Fishing was good using copper John Barrs, prince nymphs, night crawlers and salmon eggs for trout. Maxwell Lake 13: Fishing was slow for all species. Fishing pressure was light. Monastery Lake: Fishing was very good using PowerBait, salmon eggs, worms, Panther Martins and Pistol Petes for trout. Pecos River: Stream flow near the town of Pecos on Monday morning was 75.5 cfs. Fishing was very good using prince nymphs, copper John Barrs, elk hair caddis, Panther Martins, salmon eggs, night crawlers and PowerBait for trout. Aarron Vallez of Albuquerque caught his first fish this past week, a 17.5-inch rainbow. He was using salmon eggs. Fishing was fair to good using night crawlers for catfish. Red River: Stream flow below the hatchery on Monday morning was 35.5 cfs. Trout fishing was good using prince nymphs, terrestrials, worms, salmon eggs and PowerBait. Rio Grande: Stream flow on Monday morning at the Taos Junction Bridge was 155 cfs. Fishing was good using crane flies, bead-head hare’s ears, bead-head pheasant tails, elk hair caddis, gold spinners, PowerBait and night crawlers for brown and rainbow trout. Fishing was good using corn for carp. We had no reports on other species. Rio Hondo: Stream flow on Monday morning near Valdez was 9.60 cfs. Fishing was good using prince nymphs for trout. Rio Mora: Stream flow near Terrero on Monday morning was 32.5 cfs. Fishing was good using night crawlers for trout. Rio Pueblo: Stream flow near Penasco on Monday morning was 13.2 cfs. We had no reports from anglers this week. Storrie Lake: Fishing continued slow for all species. Fishing pressure has been light. Stubblefield Lake: Fishing was fair using spinner baits, senkos and chatter baits for largemouth bass. We had no reports on other species. Ute Lake: Fishing for white bass was a bit sporadic this past week as anglers did well one day and zeroed the next. When they were biting, the best action was with blade baits at 30 to 35 feet of water. Fishing for catfish was very good using shrimp and chicken livers on trot lines. Fishing was fair to good using minnows under lights for crappie. Fishing was fair using drop shot rigs smallmouth bass, although most of the fish caught were under 14 inches in length. We had no reports on other species. The surface water temp was in the mid to high 70s. Abiquiu Lake: The lake level continues to drop, and anglers should use extremecaution when launching boats. Four-wheel drive vehicles are recommended for launching. The Corps continues to evaluate conditions. Much safer launching would be with canoes or kayaks. Fishing was fair to good using swim baits, chatter baits, senkos, tubes, wooly buggers and crank baits for smallmouth bass. We had no reports on other species. Animas River: Water flow below Aztec on Monday morning was 119 cfs. We had no reports from anglers this week. Bluewater Lake: Fishing was fair to good using large spoons, crank baits and swim baits for tiger muskie. We had no reports on other species. Canjilon Lakes: Trout fishing was very good using Fire Balls, PowerBait, night crawlers, wooly buggers, Pistol Petes and spinners. Chama River: Monday morning flows below El Vado and Abiquiu were 597 cfs and 440 cfs respectively. Trout fishing below El Vado was very good using night crawlers, leech patterns and small midge patterns for brown and rainbow trout to18 inches. Anglers using night crawlers also reported catching a few largemouth bass and perch. We had no reports from below Abiquiu. Cochiti Lake: Fishing was slow to fair to good using silver Kastmasters, crank baits and spinners for white bass. Fishing was fair using cut bait, shrimp, chicken liver and spoons for catfish. Fishing was fair using spoons, jerk baits, chatter baits and senkos for smallmouth bass and largemouth bass and an occasional northern pike. Fishing was slow to fair using minnows and grubs for crappie. We had no reports on other species. El Vado Lake: Due to dropping water levels, the state park has closed off access to the boat ramp and use of motor boats. The lake remains open to watercraft such as canoes, kayaks and paddle boards. Fishing near the dam continued to be quite good this past week as anglers caught several bass and perch. They were using night crawlers crank baits, tubes and small grubs. We had no reports on other species. Fishing pressure was light. Fenton Lake: Fishing was fair using flat fish, yellow PowerBait and worms for trout. Heron Lake: The water level continued to drop this past week, but as of Monday, the La Laja and Sierra Vista boat ramps remained open. The lake level continues to drop. Fishing was slow to fair using PowerBait from the bank and trolling with spinners for rainbow trout. We had no other reports. Jemez Waters: Stream flow on the Jemez near the town of Jemez on Monday morning was 10.1 cfs. Fishing on the Cebolla was good for anglers using worms, mop flies and copper John Barrs. They reported catching mixed bags of brown and rainbow trout. Fishing on the San Antonio was fair using Fire Balls and worms for trout. We had no reports from the other streams. Lagunitas Lakes: Fishing was good using Panther Martins, PowerBait and worms for trout. Navajo Lake: HOT SPOT FOR NORTHERN PIKE: Fishing was excellent using crank baits, jerk baits, chatter baits and swim baits for northern pike. Fishing was good using chatter baits, jerk baits, senkos, swim jigs, crank baits, finesse worms, tubes for smallmouth bass and largemouth bass. Fishing was good using worms and curly tail grubs for perch. Fishing for kokanee was good trolling spinners tipped with PowerBait or corn for kokanee at 50 to 78 feet. We had no reports on other species. The surface water temp was in the low 70s. San Juan River: Stream flow below Navajo Lake was reduced on Monday afternoon to 705 cfs. Fishing was very good using parachute Adams, Chernobyl ants, hoppers, WD40s, red annelids, bead-head pheasant tails, hoppers, ants, root beers, RS2s and zebra midges for brown and rainbow trout. Through the bait waters, fishing was good using night crawlers, PowerBait, jerk baits, Panther Martins, terrestrials and copper John Barrs. Seven Springs Brood Pond: Fishing was good using PowerBait, salmon eggs, Pistol Petes and worms for trout. Tingley Beach: Fishing was good using hot dogs, homemade dough baits, liver, shrimp and worms for catfish. We had no other reports. Alumni Pond: Fishing was good using worms, hot dogs and liver for catfish. We had no reports on other species. Bill Evans Lake: Fishing was fair using hot dogs and night crawlers for catfish. We had no reports on other species. Caballo Lake: Fishing was good using slab spoons, curly tail grubs and crank baits for white bass. Anglers fishing for white bass also picked up a few walleye. We had no reports on other species. Fishing pressure remained light. Elephant Butte Lake: HOT SPOT FOR WHITE BASS: Fishing was excellent using white, chrome and chartreuse slab spoons, blade baits and crank baits for white bass. Fishing was very good using top water lures, jerk baits, senkos, creature baits, chatter baits and crank baits for largemouth bass and smallmouth bass. Fishing was good using crank baits in the Long Point area for walleye. Fishing was good using liver, cut bait and shrimp for catfish. We had no reports on other species. Escondida Lake: Fishing was very good using liver, shrimp, hot dogs and homemade dough bait for catfish. Gila River: Stream flow on Monday morning was 168 cfs. We had no reports from anglers this week. Lake Roberts: Fishing was fair using liver and night crawlers for catfish. We had no reports on other species. Percha Dam: Fishing was fair to good using night crawlers and liver for catfish. Anglers using night crawlers also reported catching a few walleye. We had no reports on other species. Rio Grande: Stream flow below Elephant Butte Monday morning was 962 cfs. Fishing was good using liver, shrimp, hot dogs and night crawlers for channel catfish. Fishing was fair using minnows, night crawlers and curly tail grubs for white bass, walleye and largemouth bass. We had no reports on other species. Young Pond: Fishing was good using hot dogs and night crawlers for catfish. Alto Lake: Fishing was fair to good using liver, shrimp and night crawlers for catfish. We had no reports on other species. Bataan Lake: Fishing was good using worms and liver for catfish. Black River: Stream flow at Malaga on Monday morning was 17.3 cfs. We had no reports from anglers this week. Blue Hole Park Pond: Fishing was fair using hot dogs, worms and liver for catfish. We had no reports on other species. Bosque Redondo Lake: Fishing was slow to fair using liver and homemade dough bait for catfish. Chaparral Park Lake: Fishing was good using chicken liver, shrimp, night crawlers and homemade dough bait for catfish. Eunice Lake: Fishing was good using worms and liver for catfish. We had no reports on other species. Green Meadow Lake: Fishing was good using liver, hot dogs and night crawlers for catfish. Greene Acres Lake: Fishing was good using hot dogs, chicken liver and homemade dough bait for catfish. We had no reports on other species. Jal Lake: Fishing was very good using worms, hot dogs and liver for catfish. Lake Van: Fishing was good using hot dogs and chicken liver for catfish. We had no reports on other species. Oasis Park Lake: Fishing was good using worms, hot dogs, liver and homemade dough bait for catfish. Pecos River: Stream flow below Sumner Lake on Monday morning was 97.2 cfs. Fishing was good using liver and night crawlers for catfish. We had no reports on other species. Perch Lake: Fishing was good using hot dogs and shrimp for catfish. We had no reports on other species. Ruidoso River: Stream flow on Monday morning at Hollywood was 6.99 cfs. We had no reports from anglers this week. Santa Rosa Lake: Anglers reported murky water conditions this week. Fishing was slow with just a few largemouth and smallmouth bass caught by anglers using ned rigs, senkos, swim baits and worms. Fishing was slow to fair using crank baits, tubes and swim baits for walleye. We had no reports on other species. Sumner Lake: Fishing was fair to good using creature baits, chatter baits, top water lures, senkos and swim jigs for largemouth bass and smallmouth bass. Fishing was slow to fair using chicken liver, shrimp and night crawlers for catfish. We had no reports on other species.